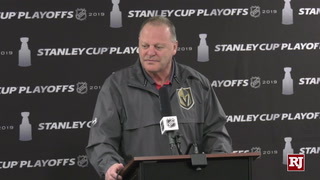 The Golden Knights and Los Angeles Kings will meet in the opening round of the Stanley Cup playoffs beginning Wednesday at T-Mobile Arena. 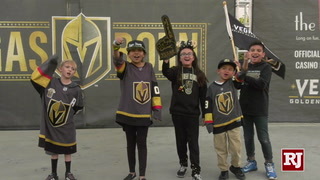 The seeds of the rivalry between the Golden Knights and the Los Angeles Kings were planted during the NHL regular season. 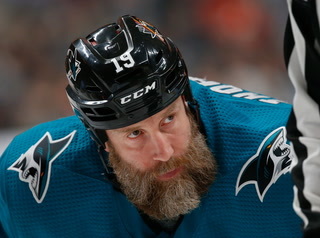 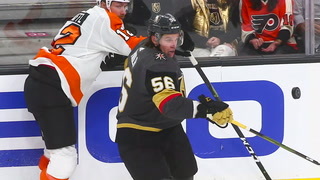 But with the teams scheduled to meet in the opening round of the Stanley Cup playoffs, there’s an opportunity for the rivalry to take firm root. 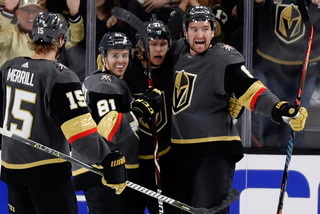 Game 1 of the best-of-7 series is 7 p.m. Wednesday at T-Mobile Arena. 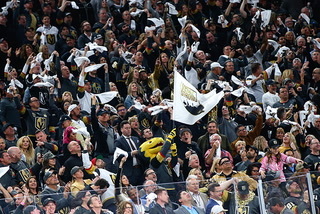 Game 2 is Friday at T-Mobile with Games 3 and 4 in Los Angeles April 15 and 17. 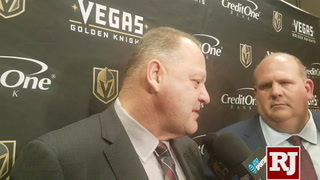 The Knights won the first two meetings, 4-2 at home on Nov. 19 and 3-2 in overtime at Los Angeles on Dec. 28. 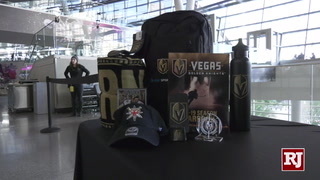 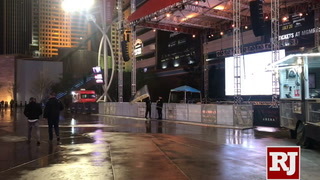 The Kings won 3-2 in OT at Staples Center on Feb. 26 and beat the Knights 4-1 the next night in Las Vegas. 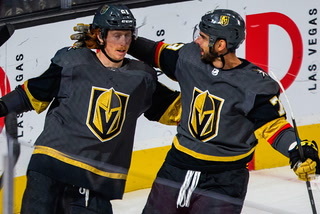 The Knights, winners of the Pacific Division in their inaugural season, finished their record-setting year with a 51-24-7 record and 109 points. 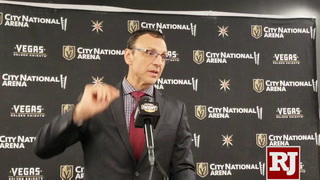 But that is behind them. 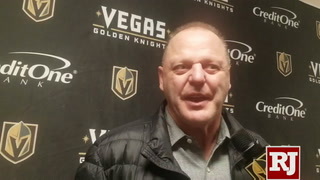 For coach Gerard Gallant, it’s about making as deep a run as possible. 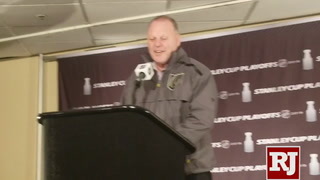 “Now that you’ve made it, you want to win it,” Gallant said. 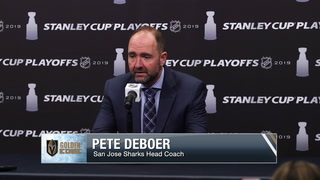 “We’ve got a veteran group that has played in a lot of big games so I don’t think the moment will be too big for us. 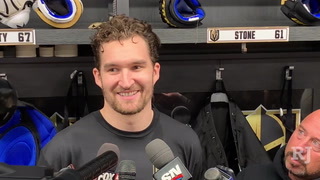 Having Smith back in the lineup Saturday against Calgary was an important step. 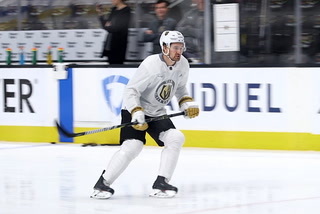 So was having forward Will Carrier back on the ice earlier in the week. 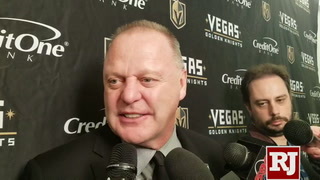 Carrier brings toughness and speed to the team’s fourth line. 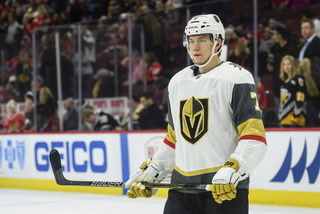 Defenseman Luca Sbisa is practicing and should be available after injuring his right hand against the Kings on Feb. 27. 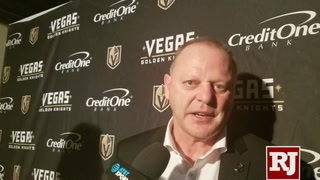 Gallant also expects David Perron to be ready; Perron has missed the last six games with an upper-body injury. 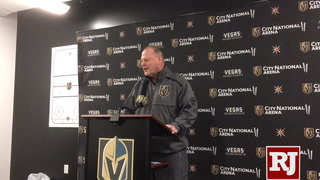 Gallant wasn’t thrilled with the lack of focus in Saturday’s 7-1 loss to the Flames, but he’s grateful the Knights didn’t sustain any other injuries as they begin preparation Monday morning at City National Arena. 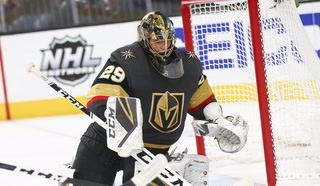 To that end, goaltender Marc-Andre Fleury survived his shaky two periods in net against the Flames and came out with only his pride wounded. 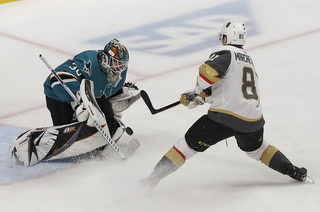 Fleury, a three-time Stanley Cup champion when he played for the Pittsburgh Penguins, goes up against the Kings’ Jonathan Quick, who owns a couple of Stanley Cup rings himself. 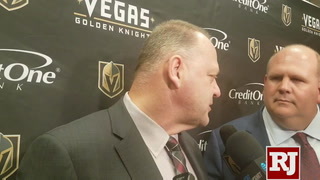 “It should be a good series,” Fleury said of the Kings. 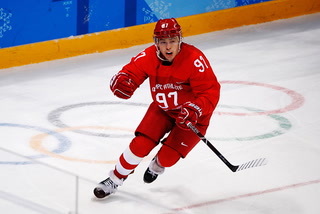 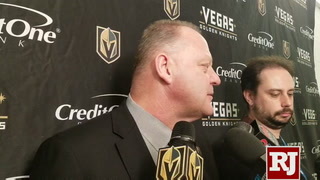 “They’re a good team and have some very good players. 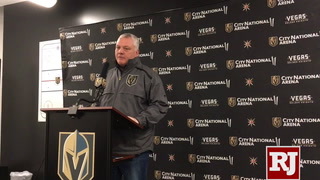 Nov. 19 — Knights 4, Kings 2 at T-Mobile Arena. 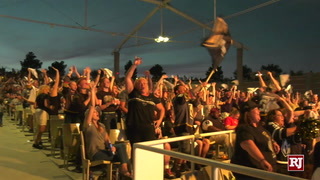 The Knights jumped to a 3-0 lead in the opening 11:22 and chased Kings goalie Jonathan Quick. 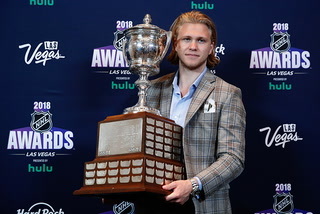 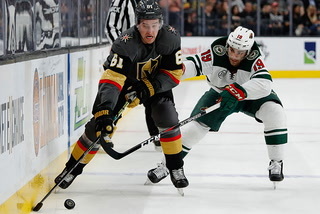 William Karlsson scored twice in the first period, and after the Kings closed to within 3-2 on goals from Trevor Lewis and Tanner Pearson, Knights right wing Alex Tuch sealed the win with an empty-net goal with 1:02 to play. 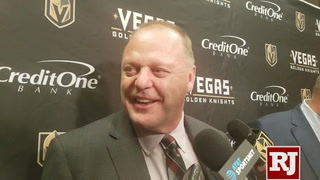 Maxime Lagace, one of five goaltenders the Knights would use during the season due to injuries, made 27 saves for the win. 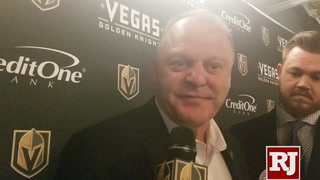 Dec. 28 — Knights 3, Kings 2 (OT) at Staples Center. 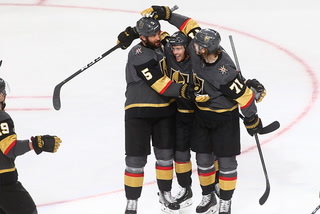 David Perron scored the game-winner with 1:30 remaining in overtime. 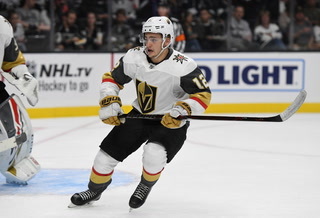 Brendan Leipsic gave the Knights a 2-1 lead 8:50 into the third period, but the Kings tied it on Drew Doughty’s goal with 4:33 to play. 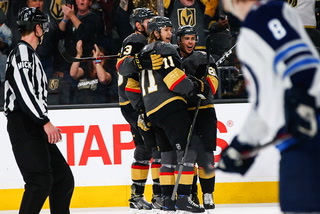 Marc-Andre Fleury made 26 saves in outdueling Quick for the win. 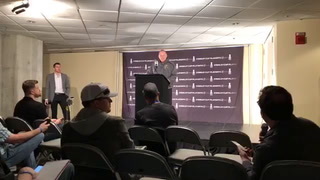 Feb. 26 — Kings 3, Knights 2 (OT) at Staples Center. 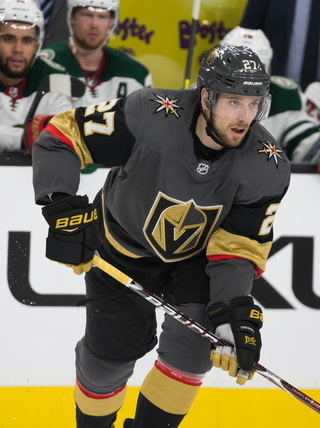 On the day the Knights acquired Tomas Tatar in a trade with Detroit, they would lose forwards James Neal and Oscar Lindberg to upper-body injuries. 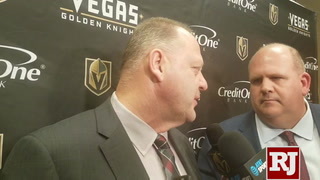 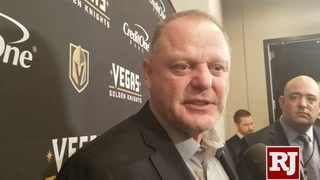 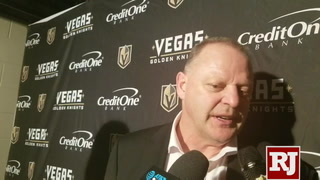 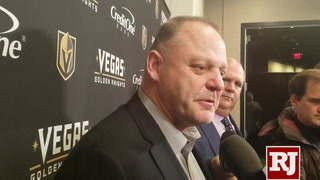 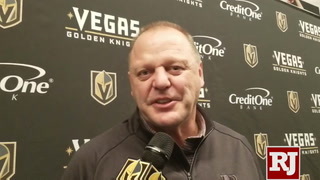 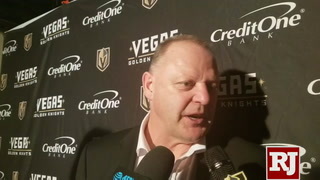 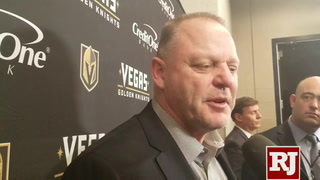 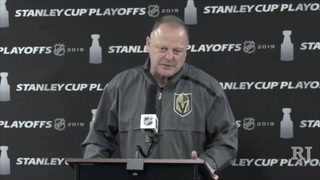 Yet despite playing with just 10 forwards, coach Gerard Gallant was able to shuffle his lines and the Knights had a 2-0 lead going into the third period thanks to goals by Erik Haula and Reilly Smith. 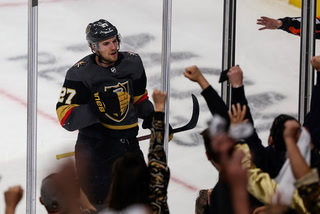 But Los Angeles rallied, and Dustin Brown won it with a power-play goal 3:14 into OT while Colin Miller was in the penalty box for hooking. 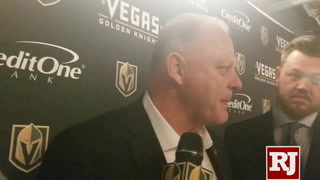 Feb. 27 — Kings 4, Knights 1 at T-Mobile Arena. 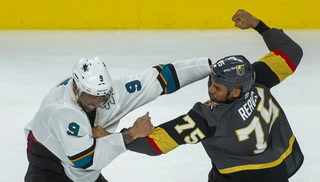 There was lots of anger left over from the loss the night before. 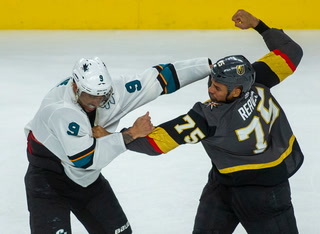 Tatar made his debut for the Knights and recently acquired Ryan Reaves was trying to exact some revenge after Kyle Clifford had knocked Lindberg out of the game Monday with an elbow to the head. 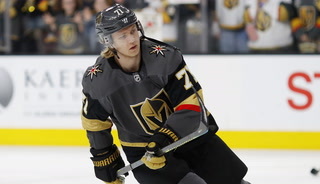 Things started well for the Knights as Karlsson scored early. 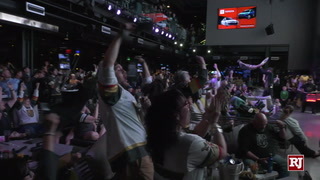 But the Kings took over and cruised to another victory. 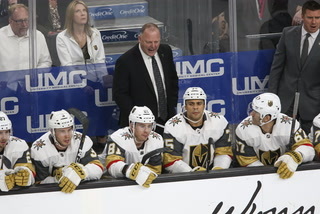 The Knights, meanwhile, lost two more players as defenseman Luca Sbisa suffered a hand injury and fellow defenseman Nate Schmidt was banged up toward the end of the game and would sit out four games.